Norwood, N.C. – Sinead Halpin and Manoir De Carneville proved to have perfect timing in their win of The Fork International CIC*** and Adequan USEA Gold Cup/PRO Tour Series. The home-turf favorites finished in a tie with Marilyn Little and RF Demeter after the cross country phase of the competition, both with a score of 49.8, but Halpin hit the optimum time of six minutes and nineteen seconds on the dot, winning the tie breaker and the CIC*** division. Halpin and her own Selle Francais gelding, “Tate,” have set themselves up nicely for Rolex Kentucky CCI**** in two weeks. Time was not on the side of a majority of the competitors in the Adequan USEA Gold Cup/PRO Tour Series CIC*** division. With the top twenty-three riders within ten points of each other coming into Sunday’s cross-country phase, the leaderboard was tight and riders knew they would have to run and jump fast and clear. Only three out of thirty-seven riders were able to make the time, with Halpin and Little being among those three. Little and RF Demeter picked up second place, with Jennie Brannigan and Cambalda finishing third. Buck Davidson and Ballynoecastle RM finished fourth on a 51.3 after picking up a bit of time on course. Kim Severson and Fernhill Fearless finished fifth. Overnight leaders Will Faudree with Pawlow, as well as veteran partners Allison Springer on Arthur fell victim to a difficult course courtesy of designer Tremaine Cooper. Springer, who had requested a few changes to the fence 21 combination earlier in the competition, obviously knew it was going to be difficult. A refusal at the fence dropped them out of the top three. Likewise, Faudree acquired a refusal at the last element of the large water jump complex. The corner had been set on a steep angle that caught a number of riders off guard earlier in the day. Faudree successfully navigated the element on his earlier rides, but lost his line to jump and just narrowly missed getting inside the flags. Stamford, England – The Land Rover U.S. Eventing Team showed that the future is bright claiming two spots within the top ten at The Land Rover Burghley Horse Trials. Sunday proved to be an influential day of Show Jumping as the leaderboard saw a huge shake-up from top to bottom. Sinead Halpin and Allison Springer put a summer’s worth of training in England, thanks to Land Rover Competition and Training Grants, to the test producing classy efforts throughout the week to claim second and sixth places respectively. Halpin (Oldwick, NJ) entered Burghley’s main arena as the overnight leader with Carriag LLC’s Manoir De Carneville but three unfortunate rails left them in runner-up position. The 12-year-old Selle Francais gelding collected twelve faults after lowering the oxer at three, the third element of the triple and the out of the double to finish on a score of 48.3. 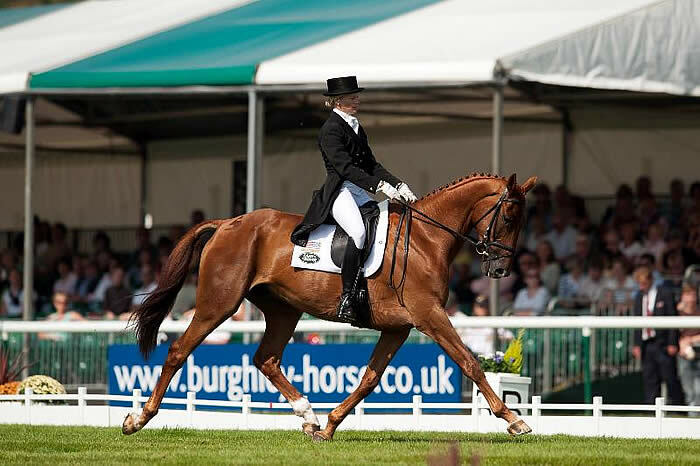 Stamford, England – On a day when quick clear rounds were at a premium, Sinead Halpin (Oldwick, NJ) proved that she is amongst the best in the sport as she maintained her dressage lead at The Land Rover Burghley Horse Trials. Halpin is competing at the historic event on a Land Rover Training and Competition Grant and has spent the summer honing her skills in England as part of the program. Captain Mark Phillip’s demanding cross country track caught out many of the top names in the sport but proved to be no issue for Halpin and Carraig, LLC’s Manior de Carneville. The classy 12-year-old Selle Francais gelding easily cruised around finishing with one of only four double clear rounds. Halpin was immensely proud of the gelding who is making a return trip to The Land Rover Burghley Horse Trials after having come 15th in 2011. She also believes his natural way of going was essential to her making the time on Saturday. Stamford, England – The U.S. riders made a bold statement after the first two days of dressage at The Land Rover Burghley Horse Trials slotting three riders into the top 15. The three Land Rover Competition and Training Grant recipients who have spent the summer training and competing in England produced top tier results in the first phase. Sinead Halpin (Oldwick, NJ) and Allison Springer (Upperville, VA) hold the top two spots amongst the field of 85 following the dressage phase after performing stellar tests on eventing’s hallowed ground. Grant recipient Halpin and Carraig, LLC’s 12-year-old Selle Francais gelding Manior de Carneville, produced a personal best test scoring an impressive 36.3 to lead the field by nearly four points. The pair performed a beautiful, consistent test highlighted by quality trot work and lovely flying changes. Burghley (GBR), 31 August 2012 – Sinead Halpin (USA), who was first reserve for the US Olympic team, finally got her moment in the sun when she took a convincing lead after the Dressage phase at the Land Rover Burghley Horse Trials (GBR), finale of the 2011-2012 HSBC FEI Classics. 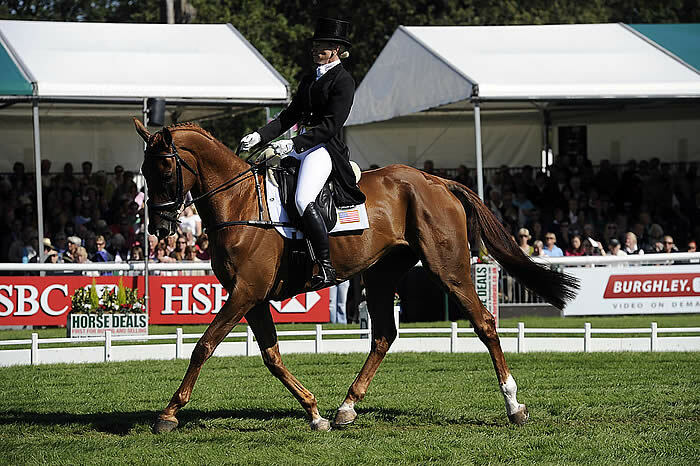 Halpin, 30, who won the HSBC Training Bursary when third on Manoir de Carneville at her CCI4* debut, Rolex Kentucky in 2011, was 15th at Burghley last year, but her test this time was 10 marks better – 36.5 – and she has a 3.7 penalty margin over the chasing pack. “It felt good from the moment he went in there,” Halpin said, after earning the only sub-40 dressage mark with an exquisite display of elastic paces, smooth transitions and general showmanship. Boyd Martin and Neville Bardos. Photos: www. stockimageservices. com. Lexington, KY – The Land Rover U.S. Eventing Team have two cross-country superstars in their midst as both Boyd Martin on Neville Bardos, and Sinead Halpin on Manoir de Carneville looked poised and confident as they galloped through Burghley Park. These pairs represented an inspiring future American Eventing over a course that was deemed a ‘throwback’ as the Land Rover Burghley Horse Trials celebrated its 50th anniversary in 2011. Clear rounds were difficult to come by over Capt. Mark Phillips boldly designed, old-fashioned feeling track. 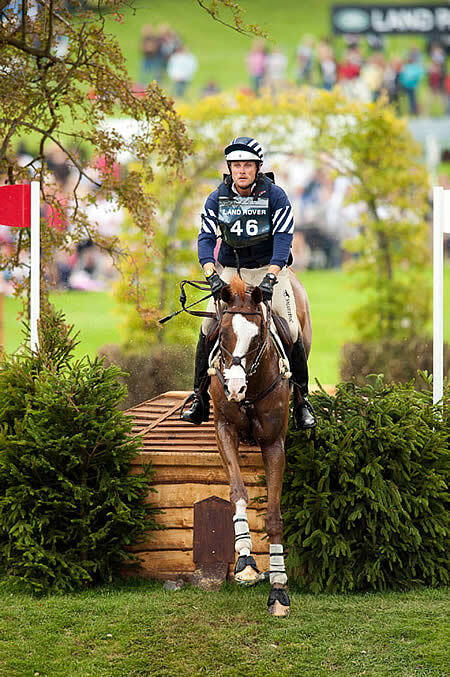 But Martin and Neville dominated their first Burghley – flying home to an emotional 11th place after the first two phases. 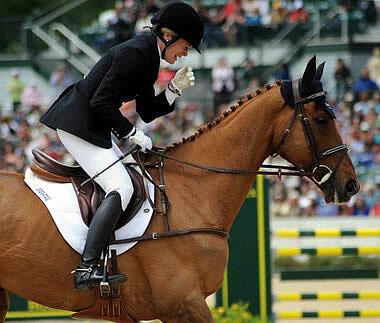 They backed up their dressage score of 49.7 with a flawless performance in Neville’s favorite phase. They were one of nine double-clear rounds of the day. The fact 12-year-old Neville Bardos (owned by the Neville Bardos Syndicate) is alive is incredible, and the fact the Australian Thoroughbred just cruised around the biggest cross-country track in the world is not far short of a miracle. 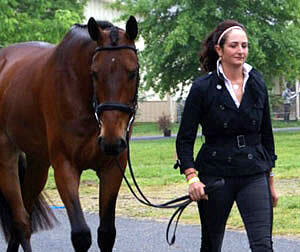 Sinead Halpin and Manoir de Carneville. Photos: www. stockimageservices. com. Lexington, KY – The dressage phase of the 2011 Land Rover Burghley Horse Trials concluded on Friday with incredibly close scores under sunny skies. Only 10 points separate the top 21 places. The riders representing the Land Rover U.S. Eventing Team are very much in the running heading into Saturday’s cross country. Eighty of the best eventing horses in the world are vying for top honors at one of the most prestigious CCI4* events in the world, and four of the five American horses are in the top 32. Germany dominated the HSBC European Eventing Championships last week and it is the nation to beat again as Simone Deitermann and Free Easy NRW leads the way at Burghley with a score of 39.3. Deitermann is 4/10ths of a point clear of Thursday’s dressage leader William Fox-Pitt on Parklane Hawk. Fox-Pitt, who has won the event five times for the home team, rode Parklane Hawk to a second- place effort on a score of 39.7 – despite a two-point penalty for an error. Sinead Halpin (Pottersville, NJ) leads the way for the U.S. with Carraig, LLC’S Manoir de Carneville, an 11-year-old Selle Francais gelding. The pair moved into 12th with an impeccable effort at their second CCI4* with a score of 46.0. Their effort was obedient and expressive, and they coped with the electric occasion of the main arena with class. Halpin’s trip to England, which also included the Hartpury CIC3* in August, was made possible by the Jacqueline Mars Training Grant awarded by USET Foundation. 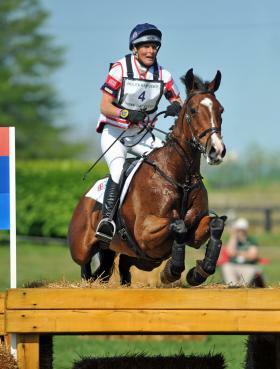 Halpin received the grant after placing third at the 2011 Rolex Kentucky Three-Day Event presented by Bridgestone, an effort which earned her and Manoir de Carneville the USEF National CCI4* Championship. The combination has forged a remarkable partnership, and their effort provided a harmonious impression that was rewarded by the judges. Sinead Halpin was overcome with emotion after a clean show jumping round on Manoir de Carneville that made her the highest-placing American at Rolex Kentucky. Photo by Nancy Jaffer. Before this spring’s Rolex Kentucky Three-Day Event, Sinead Halpin was just another face in the crowd of 30-and-under eventing hopefuls, far from the favorite to make the biggest mark at the USA’s only 4-star competition. But after her impressive third-place effort as the highest-placed American, behind British eventing legend Mary King, who was first and second — and ahead of another British legend, her former mentor, William Fox-Pitt — nothing was quite the same for the 29-year-old Branchburg resident. Halpin, who works out of Fieldstone Farm in Pittstown, noted that by the weekend of April 30 – May 1, when the Kentucky Horse Park was flooded with thousands of fans, “I didn’t really notice everybody else there. You are so focused on the task at hand,” she explained. News: The Eventing Radio Show and HORSES IN THE MORNING show will be live from Rolex Kentucky 3DE: April 27 – May 1, 2011 from 4-5:30pm Eastern.